~ by Quilly on July 28, 2008. Brilliant Quill. A true ballad of lament. Great meter and your rhyme sings easily — well done. I liked that. Good rhyme and a strong message. What poetry is all about to me. ArtPredator — double thank you — typo repaired. I do know better, I just don’t always pay attention better! Thoroughly enjoyable. I enjoyed the wry humour. 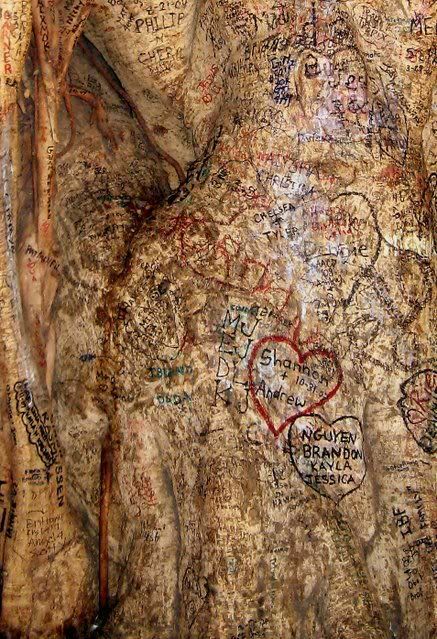 There are a few trees like this in my hometown where lovers carved their names. I wonder if the permanence of their declarations is inversely proportional to the transient nature of their love. I think you did a good job with the prompt. The ballad flows nicely and your rhyme authentic. Brad — humor is usually what I do best. I was trying so hard to be serious. Nicole — this tree stands in the International Market Place in Honolulu, Hawaii. Chances are good the romance lasted at least as long as the vacation. Love the idea behind this ballad and great picture and use of the prompt. great, both photo and words! STG — ah, yes, but loving the idea and loving the poem are two different things. 😉 It’s okay, I realize it is a bit unsophisticated, but then, so is the history of the ballad. Polona — friends like you are priceless. Love the photo AND the poem!